The Philippines is an archipelago located in the tropical region of Southeast Asia. Being situated close to the equator, the climate is hot and humid most of the year with a season marked by periods of heavy rainfall. The land is rich with natural resources and is perfect for farming and for growing a number of crops and fruit trees. The combination of the climate and the abundance of fruit crops led to a variety of Filipino drinks that are characterized by a distinct tropical taste. Long, hot summer days have led to the popularity of chilled drinks and shakes. These shakes are mostly made of the country’s common fruits mixed with shaved ice and condensed milk. Fruit shake stands are a common on the streets and provide thirsty travelers with a way to cope with the summer heat. Tropical fruits usually made into shakes are mango, dalandan, pomelo, pineapple, banana, and guyabano. The availability of the fruits depends on the season, but one can be sure that there is never a shortage of fruits to be made into fruit juices or shakes in this country. This variety makes it possible to produce different tastes; from sweet, tangy, citrusy, along with many other unique flavors. 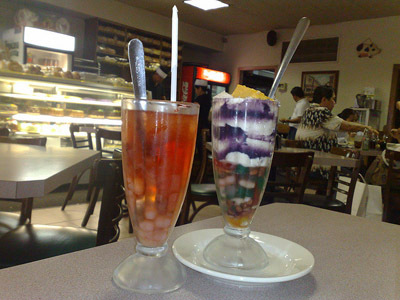 Aside from fruit shakes, a popular thirst quencher is the sago’t gulaman, a shaved ice drink with sago pearls and sliced gelatin flavored with banana extract. This is normally served in the streets and is a refreshing treat for the country’s thousands of commuters. Alongside that popular fare is the buko juice, a staple of Filipino restaurants usually served in a young coconut and sipped using a straw. Just like its neighbors in Asia, the Philippines has developed its own tea tradition although some may note that it pales in comparison to those of countries such as China and Japan. Nevertheless, teas such as salabat (ginger tea) and lemon grass have gained popularity in the country for its unique taste and the known medicinal benefits. Another noteworthy Filipino drink is the kapeng barako from the province of Batangas. halo halo is not consider a drink, it’s a dessert.